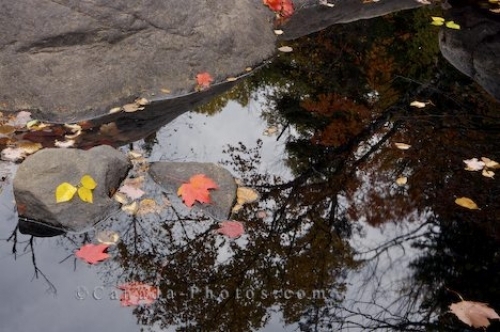 Autumn leaves adorn the trees in Lake Superior Provincial Park in Ontario, Canada with their reflections prominently displayed in the water below. Autumn leaves cling to the rocks and float aimlessly on the surface of the water in a pond in Lake Superior Provincial Park in Ontario. The trees tower above the rocks but show off their colors in the reflections of the water as the sunlight begins to diminish for the day. Picture of the reflections of the Autumn colored trees in the water around Algonquin Provincial Park in Ontario, Canada.